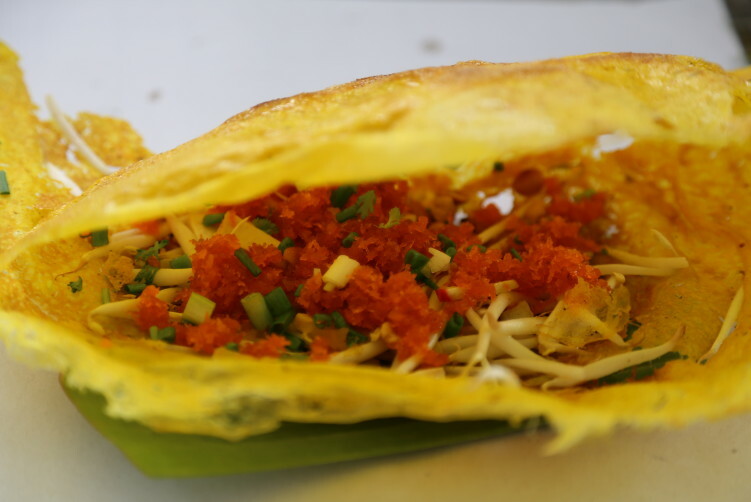 Khanom Bueang Yuan Su-Arpa (Suarpa) serves very traditional khanom bueang – a stuffed pancake that comes in two versions. It’s a rather rare treat this days, so when going to the Talat Phlu market, make sure you have room for one. You will absolutely love it. 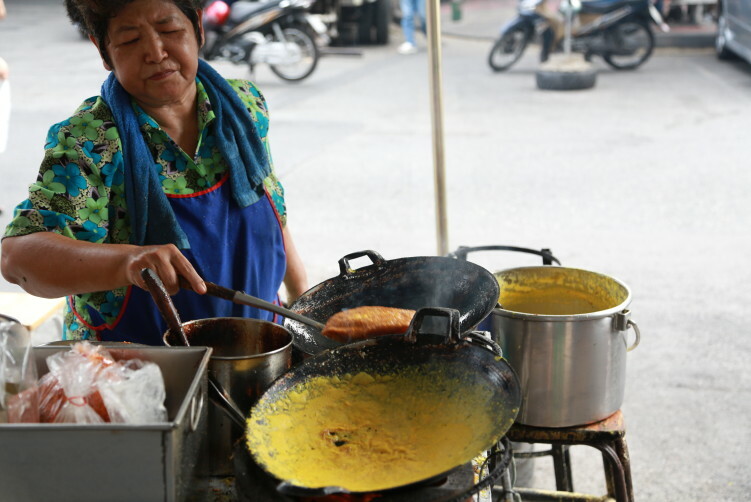 The auntie running this street food cart pays attention to every detail while cooking and use the finest ingredients in here stuffing. Absolutely addictive. The pancake (on the photo) is very thin and crispy—all done on charcoal stove. The krachik (shredded coconut) is full of flavor. The stuffing includes sweet cucumber relish, roasted peanuts, been sprouts, shrimps and fat from shrimps head, salted radish and fried tofu. The filling is sweet, salty and greasy and the bean sprouts are crispy. There are two versions here, but the one I personally prefer is the one without egg as the crust is crispy and an absolute delight. You can also have an egg version, also very good, but then the package is softer in texture. In case you’re in doubt, both of them are desserts. The auntie delivers handwork all the way, and just standing there witnessing her cooking is an experience. This is a dish I test every time I see someone making it, not to often as it is rather rare find, but non of the tested spots have been better than what I get here at the Talat Phlu Market. 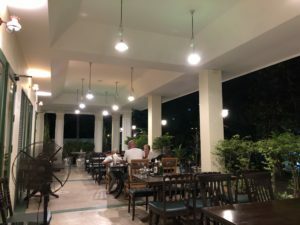 You might also find it in restaurants selling what they present as Thai Royal Cuisine, an expression I do have problems with as there isn’t a separate cuisine – it’s about presentation etc. Anyway, a restaurant version will not even come close to Khanom Bueang Yuan Su-Arpa at the Talat Phlu Market. This very traditional Khanom Bueang Yuan Su-Arpa really brings out the addiction in you as soon as you have tasted it once. Yuan implies that the origin of the dish is Vietnam. The Thai version, inspired by the Vietnam version, looks more like a Taco Shell. They are also different taste wise. My preference is the Vietnamese version. There is no seating so it is an eat on the go, or you find somewhere else to sit down. It is slightly greasy, meant in a good way, so bring a few napkins. The locals are of course flocking to this street food vendor. No menu and no English is spoken, but she understands well what you want. Just point. Honestly, I can’t wait to get my next fix of this wonderful and perfectly sweetened dessert. http://www.santacruzpumas.org/research/ order now Food: Khanom Bueang Yuan Su-Arpa. The menu also includes pastry and egg pastry. viagra canadian pharmacy order Phone: 086-988-5054. Address: Corner of Thoet Thai road and Thoet Thai Soi 18. In front of the Phet Thong Ying Heng store. Close to the Talad Plu market area. Khanom Bueang Yuan Su-Arpa (Suarpa) serves very traditional khanom bueang – a stuffed pancake that comes in two versions. It’s a rather rare treat this days, so when going to the Talat Phlu market, make sure you have room for one. You will absolutely love it. See full review at StreetsideBangkok.